Este tratamiento está basado en la lista de tareas para técnicas de conducta registrados y está destinado a cubrir los requisitos de una capacitación de 40 horas para obtener la credencial de técnico en conducta matriculado (RBT®). Este programa se ofrece de manera independiente de la junta de certificación de analistas de conducta (BACB®). Para ver las preguntes mas frecuentes desplazase hacia abajo. Para una lista de todos los topicos cubrido en ese programa. visita las preguntas mas frecuentes abajo. Este programa de capitación de 40 horas tiene todos los requisitos necesarios para ser técnico de conducta registrado. This is a practice test for the RBT exam. You get two attempts at the exam. Your sco.. The BCBA Supervisor's Manual and a supervisor version of the RBT Course. This version of the course ..
Este curso es para los supervisores del personal que está completando nuestro curso de 40 horas de c.. This training is for anyone who would like more information on evidence-based ways to teach their child or clients using principles of Applied Behavior Analysis. The training is suitable for adults ages 18 and up with a high school equivalent degree. 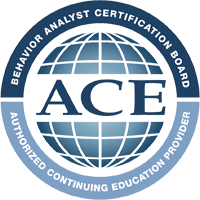 It is designed to complete training standards for a BACB Registered Behavior Technician, but is offered independent of the Behavior Analyst Certification Board (BACB). Does this training cover the RBT Task List from the BACB? This training is designed to cover all of the content on the BACB RBT task list. Primarily these topics consist of conceptual understanding of the principles and interventions of applied behavior analysis as well as evidence-based strategies for working with individuals with autism spectrum disorder. This includes a variety of topics necessary to pursue a career as a behavior interventionist working with ASD or other developmental disabilities. This training is It is offered independent of the BACB. What is a Registered Behavior Technician or RBT? A registered behavior technician is a nationally recognized registry of individuals who function as behavior interventionists and practice Applied Behavior Analysis (ABA) therapy under the supervision of a Board Certified Behavior Analyst. If you have specific questions about RBT certification, contact the Behavior Analyst Certification Board at RBT@bacb.com or 720-438-4321, (Monday to Friday) from 9:00 am to 4:00 pm Mountain time. Why is the training so affordable? The mission of Behavior University is to bring high quality educational experiences to the public at an affordable price to reduce some of the barriers families face when seeking treatment for their children with autism spectrum disorders. To fulfill our mission, we develop courses, recruit presenters, and build supports in the most cost effective manner we can so that we can offer you valuable products without breaking the bank. What if I need more time to complete my course? The Behavior Analyst Certification Board sets a limit of 180 days to complete the 40 hour RBT™ training. Behavior University cannot offer extensions or exceptions to this rule. If you are not able to complete your course within the 180 days, please contact us at info@behavioruniversity.com to inquire about options available to you. The training includes just over 40 hours of lecture and lessons. It can be completed at your own pace via an internet accessible personal computer or tablet. The BACB	requires that you complete your RBT training within 180 days. To earn a valid certificate that you can use to apply for the RBTregistry, you must complete your course within 180 days. Extensions are not available. Individual time to complete the course will vary as the amount of time spent on quiz questions and reviewing content will be particular to each user. The minimum amount of time spent in the course will be 40 hours. When I complete the training, am I certified? Once you complete this online training you ARE NOT a “Registered Behavior Technician”. After completing training, you will need to complete an application process, pass a live observation assessment (conducted by your supervising BCBA), and pass the national RBT examination (provided through the Behavior Analyst Certification Board) in order to become a "Registered Behavior Technician. All RBTs must be supervised by a BCBA or a BCaBA. You cannot operate without a Board Certified Behavior analyst supervising you. It is potentially dangerous as well as unethical to provide therapy independently. Completing this training DOES NOT authorize you to imply that you are qualified to provide any kind of therapy autonomously (i.e., by yourself, without supervision). Where do I find a BCBA to supervise me? You can see a list of BCBAs willing to provide supervision and email them through the registry to ask if they are looking to hire interventionist (many are, most states are in great need of behavior interventionists). You may also conduct an online search in your state for companies which provide Applied Behavior Analysis therapy and directly contact them to inquire about employment as a behavior interventionist. How does the Practice Test work? The RBT™ Course comes with a Practice Test to help you prepare for the national RBT™ exam by the BACB. Our Practice Test has 85 questions covering the RBT™ Task list. The Practice Test is untimed but displays a timer so you can track your progress and work towards the 90 minutes allotted for the BACB exam. The Practice Test becomes available to users upon completion of the 40 hour course. Users may take the Practice Test twice. Results are displayed and compared upon completion. Your access to the Practice Test does not expire. Once you complete the course, your RBT™ Training Certificate will be available for download. You may use the Practice Test immediately or you can wait until you are closer to the time when you will take the national BACB exam. Once I Complete the Training, what are the next steps to become an RBT? The next step is to work with your BCBA supervisor to schedule a direct observation Competency Assessment of your abilities to implement the procedures that you learned about in the 40 hour online training, and have been practicing during your work the home, clinic, school, or community setting where you have been gaining experience. Once you “pass” the assessment, you can send your application to the Behavior Analyst Certification Board (BACB) and schedule your written exam.